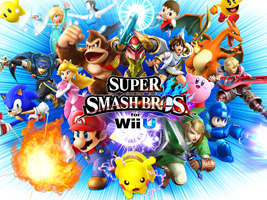 A fighting-platformer hybrid packed with characters, items, stages and music from other Nintendo games. The series has proven to be a massive success for its simple-to-learn, hard-to-master play mechanics, plus the nostalgia factor of the massive cast. The series is also packed with collectables and secrets. The Trophy Mode, in particular, celebrates Nintendo history with 3D models of Nintendo characters from the company's history – and inspired the creation of this website!